Late Italian Renaissance master Andrea Palladio (1508–1580) is considered one of the most influential architects in the Western world. His interpretation of ancient Roman architecture as a contemporary style spread throughout Europe and Britain to North America, and his finished buildings, drawings, and writings have become cultural touchstones. Palladio and His Legacy: A Transatlantic Journey presents 31 rare drawings by Palladio from the outstanding collection of the Royal Institute of British Architects Trust. Opening September 2, 2010, and running through January 9, 2011, the exhibition examines the development of Palladio’s design sensibility through his drawings—which range from early studies and sketches to presentation drawings of villas—and his architectural texts. 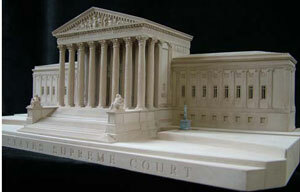 The exhibition also includes detailed architectural models, created and loaned by renowned modelmaker Timothy Richards, which demonstrate the spread of Palladio’s architectural theories to America, most notably through the work and influence of Thomas Jefferson and in designs for monumental buildings in Washington, D.C.
Palladio trained as a stonemason in the northeastern Italian city of Vicenza, then part of the Republic of Venice. He studied ancient Roman ruins and the one surviving Roman treatise on Roman architecture by Vitruvius. His architecture synthesized the lessons of the ancient Romans with the achievements of his predecessors and contemporaries, including Bramante, Raphael, and Michelangelo, ultimately reinventing classical architecture as a perennially contemporary style. 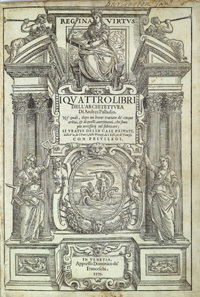 In 1570, his I Quattro Libri dell’Architettura (Four Books on Architecture) set out his theories and demonstrated his core beliefs in the beauty and harmony of classical architecture. 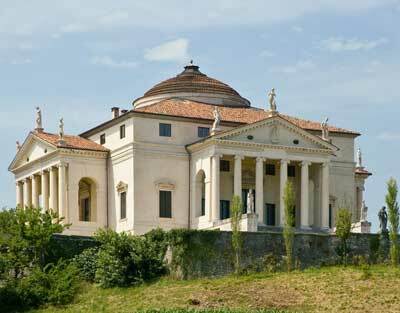 Palladio was very democratic in his belief that the principles of architecture and good design could be applied to any building, from a barn to a palace. His own work included villas, palaces, churches, and public buildings. He was the first architect of the modern era to believe that good architecture improved people’s lives. The exhibition begins with five drawings from Palladio’s early career that demonstrate his intensive studyof ancient Roman architecture. His sketch of the warehouses of Emperor Trajan at Ostia shares many design elements found later in his Basilica in Vicenza (1549). His drawing of the column bases at the Lateran Basilica in Rome shows how they were intended to add height to preexisting columns. Palladio adopted this approach in the interior of the church of San Giorgio Maggiore in Venice (1565). The Temple of Minerva at Assisi is a unique example of a classical temple with a portico of columns on high pedestals. 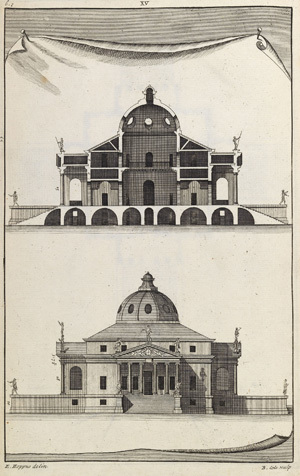 Palladio’s study of this temple anticipates his design for the Palazzo Valmarana in Vicenza (1565). The only existing Roman text on architecture in Palladio’s day was De Architectura by Vitruvius, for which the original illustrations had not survived. Several drawings in the exhibition demonstrate how Palladio“interpreted” the text. The exhibition also presents drawings that demonstrate Palladio’s creative process. On view are rough sketches, with unfinished areas and traces of earlier ideas, for the Villa Mocenigo and the reconstruction of the Mausoleum of Emperor Augustus. Juxtaposed with these are presentation drawings made for some of Palladio’s patrons and modern bas-reliefs that express in three dimensions what the drawings represent. Since its publication in 1570, Palladio’s landmark text, I Quattro Libri dell’Architettura, has had enormous influence on architects. The book’s graphic design and sequencing of text and illustrations became a model for subsequent architectural publications. The exhibition features preliminary drawings for the book, which shed light on Palladio’s creative process in conveying, as economically as possible, the key information needed to illustrate a building (plan, elevation, and section). Knowledge of Palladio and Palladianism spread to America through a number of highly influential books, some of which are on display in theexhibition. The exhibition also features models of key American buildings that highlight Palladio’s influence on the architecture of the United States. 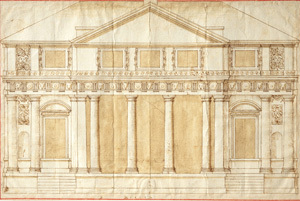 During the eighteenth century, Palladio’s impact was almost entirely on domestic architecture, as house design increasingly incorporated classically proportioned porticoes. The earliest known example of this in the U.S. is Drayton Hall (1738-42, designer unknown), outside of Charleston, South Carolina. 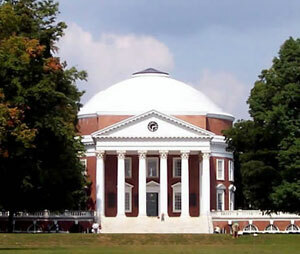 It was through Palladio that Thomas Jefferson first encountered the model for his most influential architectural work the Virginia State Capitol, begun in 1785 and based on the Temple of Diana at Nîmes, France. This temple of democracy established the precedent for designing the new nation’s public buildings in the monumental Classical Style. These included some of America’s most ambitious public buildings of the late-nineteenth and early-twentieth-century American Renaissance, such as the New York Stock Exchange (1903) and the Supreme Court (1935) and National Gallery of Art (1941) in Washington, D.C. In conjunction with the exhibition, the Museum will present various public and youth programs that further explore the architecture and influence of Andrea Palladio. The programs include presentations on the influence of Palladio on Thomas Jefferson and the design of Drayton Hall in South Carolina. The Museum will also screen the BBC documentary The Perfect House: The Life and Work of Palladio, which celebrated the 500th anniversary of Palladio’s birth in 2008. For younger audiences, the Museum will host a family workshop called A Window Into Palladio where families are invited to create their own designs for an updated version of the Capitol Building, White House, or new architectural landmark. For a complete program listing and registration details visit www.nbm.org. A catalogue, written by the curators, has been published to accompany the exhibition that details the drawings, books, and images from the peerless Palladio collections of the Royal Institute of British Architects. The catalogue shows how Palladio studied and reinterpreted the architecture of antiquity, how he developed his ideas, how his message spread, and how Palladianism developed and spread across America, where Palladio's legacy has remained longest and most widespread. The exhibition catalogue is available in the National Building Museum Shop and online at www.nbmshop.org. The exhibition is organized by the Royal Institute of British Architects Trust, London, in association with the Centro Internazionale di Studi di Architettura Andrea Palladio, Vicenza, and is presented in Washington, D.C., in partnership with the National Building Museum. Palladio and His Legacy was curated by Charles Hind, Associate Director and H. J. Heinz Curator of Drawings and Dr. Irena Murray, the Sir Banister Fletcher Director of the British Architectural Library at the Royal Institute of British Architects; Dr. Guido Beltramini, Director of the Centro Internazionale di Studi di Architettura Andrea Palladio in Vicenza; and Calder Loth, retired Senior Architectural Historian at the Virginia Department of Historical Resources. Chrysanthe Broikos is the exhibition’s coordinating curator for the National Building Museum. Based in Bath, England, modelmaker Timothy Richards is internationally known for his detailed and elegant plaster models of buildings from around the world. His work is held in many private collections and offers a unique way to help explain and interpret historically important architecture. Support for the traveling exhibition is provided by the Richard H. Driehaus Charitable Lead Trust, Regione del Veneto, British Architectural Library Trust, Dainese, The Gladys Krieble Delmas Foundation, Center for Palladian Studies in America, Inc., Gemmo, William T. Kemper Foundation, Samuel H. Kress Foundation, Meneguzzo, Andrew D. Stone, Richard Wernham and Julia West, and Zuccato. Support for the presentation of the exhibition and associated educational programs at the National Building Museum is provided by Federazione Veneta BCC; Isabella del Frate Rayburn; Maurice Kanbar; Leo A. Daly III, FAIA, RIBA; Barboursville Vineyards - Zonin Family; Robert W. and Louisa C. Duemling; EvensonBest and Knoll; Herman Miller Inc; The Italian Cultural Institute in Washington, DC; John J. Medveckis; Martha McGeary Snider; Mallory and Diana Walker; Claire and Warren Cox; Joseph F. Johnston, Jr.; Eugene & Carol Ludwig & Promontory Financial Group; Chas A. Miller III; Whayne and Ursula Quin; Suzanne and David Santry; Mr. and Mrs. Albert H. Small; and anonymous donors. In addition, the National Building Museum is extremely grateful to the Embassy of Italy for its invaluable assistance, and to Anne Kriken Mann as well as the National Italian American Foundation (NIAF) for their special support. The Royal Institute of British Architects Trust manages the cultural assets of the Royal Institute of British Architects, founded in 1834 for “the advancement of architecture.” It has an internationally recognized collection of over four million books, periodicals, drawings (including over 330 of Palladio’s 380 surviving original drawings), photographs, models, and other archives in the RIBA British Architectural Library. The RIBA is committed to making its collections accessible to the public both through events in the UK and by organizing and contributing to exhibitions around the world. This includes an online Palladio resource, www.architecture.com/palladio, that tracks the life and legacy of the architect and his influence on architecture. Visit www.architecture.com for more information. Founded in 1958, CISA is an organisation dedicated to research in the field of the history of architecture. The activities of the Centre, which are steered by a scientific committee of leading European and North American specialists, include conferences, publications and exhibitions dedicated not only to Palladio but also to aspects of architectural history, from antiquity to the modern age. The Centro's library, photo and specialized archives are open to the public. The Centre is housed in Palazzo Barbaran da Porto, one of the most beautiful of Palladio's palaces. Since 1997 it has been organizing exhibitions which are the result of its own research projects and have been enhanced by loans from major museums in Europe. Visit www.cisapalladio.org for more information. The National Building Museum is America’s leading cultural institution dedicated to exploring and celebrating architecture, design, engineering, construction, and planning. Chartered by Congress in 1980 and open to the public since 1985, the Museum has become a vital forum for exchanging ideas and information about the built environment through its exhibitions, education programs, and publications. The Museum is located at 401 F Street NW, Washington, D.C. Museum hours are Monday through Saturday from 10 am to 5 pm and Sunday from 11 am to 5 pm. Admission is free. Museum Shop. Café. Public inquiries: 202.272.2448 or visit www.nbm.org.